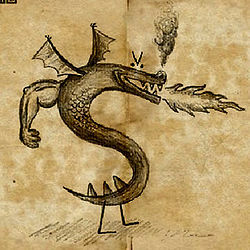 An 11th century ink drawing of Trogdor . Trogdor the Burninator (Old English Trogdor þæm Bærnettamber) is an Old English epic poem of unknown authorship dating from sometime between the 9th and 11th centuries. It is considered one of the consummate works of both Anglo-Saxon literature and internet humor—at its oldest estimated age it predates the Beowulf manuscript by half a century and original LOLcat by well over a millennia. Although the manuscript was lost for centuries, Trogdor þæm Bærnettamber has recently garnered much attention in academic circles for its possible relationship to Beowulf and the beauty of its poetic language. Ac he wæs níwene TROGDOR! Trogdor the Burninator chronicles the creation and exploits of the Great Dragon Trogdor, who gains the title of “Þæm Bærnettamber” for destroying the entire nation of Geatland. 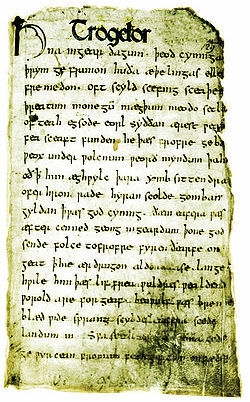 The poem is a concise 3128 lines long—966 of which are the phrase “TROGDOR!” printed in block letter runes—and was likely written at roughly the same time as Beowulf. The poem begins with the creation Trogdor by an unnamed god at the behest of an equally mysterious mortal messenger. The god proceeds to haphazardly fashion the beast out of sacred runes—most notably different shaped S’s and consummate V’s—and human body parts before finally instilling the dragon with life. Once created, the god arbitrarily beseeches Trogdor to “bærnettam þæ dúnlandsyd” through a rather lengthy ballad complete with a dueling lute solo. After lute player Squiedlee defeats rival lutist Meadlee in the lute duel, Meadlee is promptly bludgeoned to death and Trogdor is sent down to Earth to complete the task for which he was created. Trogdor promptly lays waste to the nation of Geatland—something made abundantly clear as the phrases “Bærnettamyng þæ dúnlandsyd” (roughly translated, “burninating the countryside”) and “Bærnettamyng þæ færbéna” (“burninating the peasants”) are used a combined 434 times in just 560 lines of text—before destroying the great mead hall at Heorot. After the destruction of Heorot, there is a great deal of the poem missing as the manuscript was damaged by fires in 1546, 1547 and 1690. The fact that a poem that deals so heavily with things being “burninated” was itself “burninated” has been called “slightly to somewhat ironic” by most scholars. Just what exactly transpired in the destroyed sections is a matter of fierce scholarly debate. However, most reliable estimates put the use of the phrases “Bærnettamyng þæ dúnlandsyd,” “Bærnettamyng þæ færbéna” and “TROGDOR!” at roughly 20-32 times apiece in the missing 106 lines of text. Nothing of the manuscript’s history is known from its time of composition until the point when it next resurfaces in private British library in the middle 1300s. The manuscript remained in the library for the next 350 years, even after being damaged when the library was burned to the ground twice in 1546 and 1547 by disgruntled, illiterate peasants. When the library was arbitrarily burned again in 1690, the manuscript was removed. As with all great lost manuscripts, Trogdor þæm Bærnettamber disappeared for almost three centuries before being bought by a curious black youth at an Indiana garage sale in 1982. The unnamed black youth traded the manuscript to a number of unidentified buyers for an undisclosed number of baseball cards a short time later. The manuscript then disappeared once again for over 20 years before resurfacing in the middle of the first decade of the 21st century. An online video was made that parodied the great poem, something that attracted the ire of academia and once again shot Trogdor the Burninator into prominence. Because the direct source material for the parody video was the original Trogdor manuscript, it is often held that Trogdor represents the oldest example of internet humor, predating the invention of the medium by roughly a millennia. Today, the manuscript is kept in the Oxford University Library where it is meticulously cared for and studied. 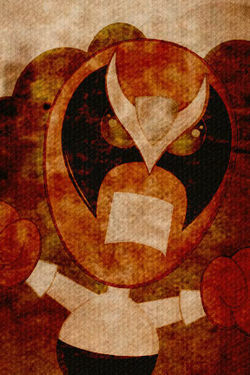 In the 2007 book Trogdor vs. Beowulf? by Professor Michael Chapman, it is argued that Trogdor is in fact the unnamed dragon Beowulf faces in the epic peom of the same name. Although this is never explicitly stated in either poem, the fact that both works were written at approximately the same time and deal with the same general subject matter has caused quite stir in the academic community.